Mindfulness is “paying attention on purpose” in a nonjudgemental way that promotes awareness and acceptance. Practicing mindfulness has been scientifically proven to promote social-emotional regulation, cognitive clarity, and overall well-being. My APS colleague, Alexandra Midland, and I authored a series of experiential Mindfulness for Educators workshops to explain the what, why, and how of mindfulness, as well as share strategies for cultivating and deepening a mindfulness practice. If you are interested in attending a Mindfulness for Educators workshop or scheduling one at your school, email Erin for more information. 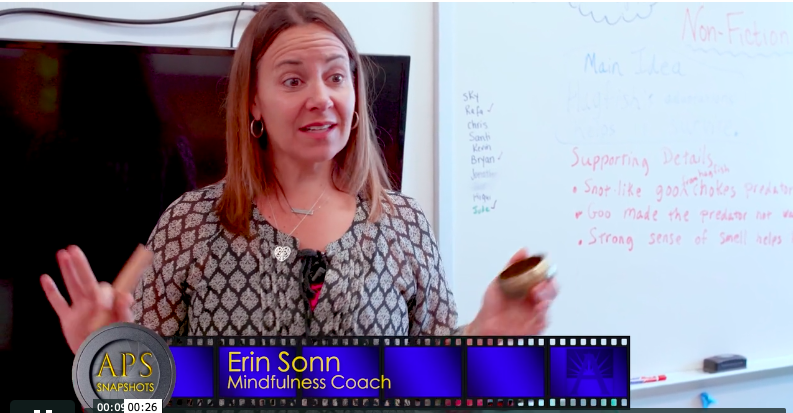 Watch this APS Snapshots video to learn about Erin’s work to share mindfulness practice with students and teachers at Abingdon Elementary School.